HALFDAY TOUR: Morning: 08.30hrs. - 12.00hrs. Afternoon: 13.30hrs. - 17.00hrs. Chiangmai, "Flower of the North or Rose of the North" was found in AD.1296 and today remain the second largest city in Thailand. This tour is planed as an introduction of the Northern culture and life style of local people. Visit WAT CHIANGMAN (AD.1297), the oldest temple within the city walls. Drive through many different part of the Northern capital, passing residential areas, notable foreign establishments, handsome government buildings. Chiangmai is now launched to be a duty free city by the Government where you can buy and shop local products, clothes, neck-tie, perfumes, electric products and etc. Visit a quant and picturesque Meo Hilltribe Village set in an attractive hillside spot and see the Meo tribesmen dressed in their colourful traditional customs. The tour also takes in WAT PHRATHAT DOI SUTHEP (3,520 feet above mean sea level). The magnificent stairway leading to the temple. The pagoda style temple and the bird's eye view of Chiangmai. HALFDAY TOUR: Morning: 08.30hrs. - 12.00hrs. See elephants at work in a jungles area, hauling logs, and other displays. Elephant riding and bamboo rafting, visit a quant and picturesque MEO HILLTRIBE VILLAGE. On the way back to town visit ORCHID FARM, see the fantastic wild orchid collection. Full day excursion to Chiangrai (approx. 4hrs. by air-conditioned van or car). Chiangrai is situated at highest point of Thailand. Visit Chiangsaen, the old capital of Lanna Kingdom. 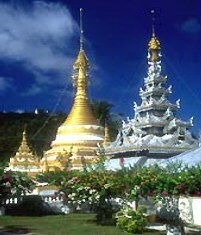 Visit the Golden Triangle and Mae Sai which is the Northest town and further to Thai-Myanmar border lines. If time allow the visit of hot sprint will be added. WAT PHRATHAT DOI SUTHEP is one of the most sacred temple in the North tucked away in the mountain at 3,520 feet. PHU-PING PALACE, their majestics' winter palace (4,300 feet) and see the delightful garden. Note: On the day when PHU-PING PALACE is not opened, WAT JED YOD will visit. Daily: Evening 19.30hrs. - 21.45hrs. An evening of experience with Northern fold dancings featured FORN LEB (nail dance), SWORD DANCE, FORN THIEN (candles dance) and THE RAMWONG (nation-wide dance). After typical Northern dinner being served during the show. There will be a special hilltribe show featuring the virous tribes of the North. Breakfast at hotel, visit Akha & Yao Hilltribe Village. Visit Chiangsaen the ancient capital of Lanna Kingdom, the Golden Triangle the border lines of Thai-Myanmar-Laos meet. Lunch at the local restuarant. Continue to the Northest town of Mae Sai and depart for Chiangmai. Departing Chiangmai for Mae Hong Sorn by TG190 dep. 10.00hrs. arrive 10.40hrs. Upon arrival, tranfer to Mae Hong Sorn Riverside Resort or similar. Start tour by boat along the Pai River for 1.30hrs. to visit Long Neck Karen Village (Pa Dong). Local lunch restuarant. Safari tour start by elephant riding for 1.30hrs. view the National Park Valley along the way. Dinner and overnight at the resort. Breakfast at the resort. Visit WAT PHRA THAD DOI KONGMOO, viewing from the broad valley below and spectacular mountainous stretches of both Thailand and Myanmar. Then stop at WAT JONGKAM and WAT HUA WIANG. It is famous for Buddha Image "Phra Palakang". Lunch at local restuarant and free for your leisure. Depart for Chiangmai by TG197 dep. 16.50hrs arrive 17.25hrs.